Julian Gonsalves works for the International Institute of Rural Reconstruction and promotes GROW BIOINTENSIVE practices in the Philippines. 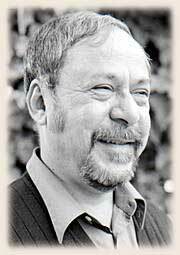 Gonsalves said that he read How To Grow More Vegetables over 20 years ago, and attended the 1981 conference co-sponsored by Ecology Action while still a student at Cornell. He stated that attending was the best decision he ever made: "It transformed my life and work." He returned to the Philippines during the sugar crisis, when world sugar prices had plummeted. Sugar workers on the Island of Negros were suffering severely from the crisis. Gonsalves said that he was able to use GROW BIOINTENSIVE as an entry point in teaching people to grow their own food. The program was so successful that the government redistributed 5,000 acres of land to people for food growing and eventually initiated a GROW BIOINTENSIVE gardening program in the schools. Since that time, 23,000 family gardens have been started. Gonsalves said that the typical garden has 2 double-dug beds with vegetables grown along the fence line and on trellises. A row of trees is planted to provide leaves for compost. He stated that in tropical climates, organic matter is depleted rapidly, so they suggest that compost be placed deeper in the soil than normally. Liquid manure is also used because heavy rains leach nutrients out of the soil quickly. Gonsalves emphasized that the IIRR functions as a catalyst. They train the people who train others, and in this way, 3,000 to 5,000 people a year are taught. 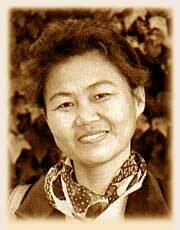 Irina Kim is a soil scientist and teacher of GROW BIOINTENSIVE from Chirchik, Uzbekistan. She asked to be given time to speak to share her experiences. Kim first called up John Jeavons and presented him with a traditional robe and hat, as well as hats for his wife and daughter. She then described Uzbekistan as a country about 1/100th the size of the U.S. that has economic problems. In 1994 she received the only copy of the Russian translation of How To Grow More Vegetables in her country. Kim said that she immediately understood its importance and it became like a sacred reference for her. She knew she had to spread the information as quickly as possible. Kim was a high school teacher, and she received permission to teach GROW BIOINTENSIVE as a subject in school. She also spread the word through the newspapers, magazines and on television. She wanted this to be a practical skill, too, and therefore she organized a club for children from 26 schools. They worked for a long time, from kindergarten students through the whole school population. There was only the one book, and she also used it to teach older people twice a week. Kim said how powerful it is "to think we can grow our food at our own home - it will save us from starvation." She expressed her gratitude to the volunteers from the United States who have come to Uzbekistan to help her teach courses. My experience over five years of studying and teaching the GROW BIOINTENSIVE method to students and adults has proven the importance of this technology for Uzbekistan. I have had positive results in the rooting, growth, development, and yield of vegetable crops, and have also observed water conservation: for tomato, cabbage, and pepper, 97%-100% of the transplants took root in the GROW BIOINTENSIVE beds, while only 70%-90% took root in the traditional beds. Juan Manuel Martinez is the director of ECOPOL, a nonprofit organization responsible for initiating and coordinating all GROW BIOINTENSIVE activity in Mexico and Latin America. The speakers from Latin America brought much heart and inspiration to the conference. 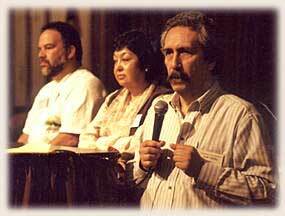 From left to right: Padre Julio, Mercedes Torres, and Juan Manuel Martinez. 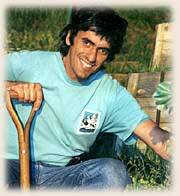 Martinez said that he first was introduced to GROW BIOINTENSIVE in 1983, after investigating several types of sustainable small-scale agricultural systems. The problem with many of them was their dependence on chemicals and outside inputs. He found that GROW BIOINTENSIVE could help people be independent because they could use resources from within their community. To prove its worth, he tried it out in one of the most difficult areas that had poor soil and a high rate of malnutrition and infant mortality. Martinez stated that after 5 years of intensive work in this area, first and second degree malnutrition had disappeared and infant mortality was reduced. He pointed out that this was not entirely due to GROW BIOINTENSIVE but that it was instrumental. Martinez said that 63% of his country is arid, only 12% is cultivated and of that 12% only 3% is fertile and needs no irrigation. And this area, he stated, produces export crops. Martinez gave a slide show of some of the GROW BIOINTENSIVE work in Mexico, including with the Tarahumara Indians in Chihuahua state. He pointed out that GROW BIOINTENSIVE is very similar to the traditional farming methods of the Tarahumara, and that is the reason it has been so readily accepted by them. He cited the remarkable figure that about 7 million people in Mexico have been trained in GROW BIOINTENSIVE mini-farming practices during the last 11 years. Martinez ended by saying, "The problems of the world cannot be solved by skeptics or pessimists. We need men and women who can dream things that have not yet happened and who ask themselves 'why not.'" 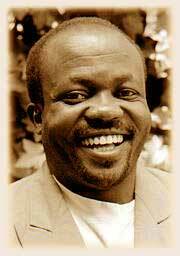 Emmanuel Omondi is the director of Manor House Agricultural Centre near Kitale, Kenya. Omondi showed slides during the course of his presentation to illustrate the many activities of the Centre. He mentioned that rapid population growth and less-than-optimal farming techniques have contributed to declining land quality. He stated that a recent study funded by the World Bank indicated that 47% of people in rural areas are "absolutely poor." The study also showed that 60% of Kenyans grow their own food. Omondi went on to say that for 15 years Manor House has been working with the rural poor. The Centre offers a 2-year certificate course in GROW BIOINTENSIVE Agriculture (BIA), as well as 3-month and 6-week courses and 1-week workshops for farmersÕ groups and others. Just before the start of the conference, Manor House held a field day on its grounds. It was in conjunction with graduation ceremonies for those who had completed the 2-year course. Omondi said that about 200 to 300 people generally attend this ceremony, and this is the number they were expecting, but that this year 1,000 people showed up. He said they were very encouraged because they believe it shows that many people in Kenya are waking up to the need for this kind of high-yield, resource- conserving agriculture. When Manor House started in 1984, they were the only ones in Kenya teaching BIA. Now 40 organizations are teaching it. As of now, over 70,000 Kenyans have been taught directly and indirectly. their costs using GROW BIOINTENSIVE were about half of the conventional method costs. Omondi closed by stating he believes that "GROW BIOINTENSIVE is the answer to food needs now and forever." 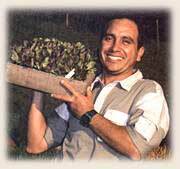 Fernando Pia is an agronomic engineer, working for the Rural Extension Service in Patagonia, Argentina. He is the founder and director of CIESA, the Center for Research and Demonstration in Sustainable Agriculture. Pia began with some facts about soil loss in Argentina: 150,000 acres of topsoil have been lost, and in the richest food-growing areas of Argentina, 100,000 pounds of topsoil are being lost per acre per year. He then gave a slide presentation which beautifully illustrated his talk. Pia traced his frustrations as an agricultural extensionist who did not have the solutions that would stem the migration of indigenous Mapuches from their unproductive land to the cities or to help people from the cities who wanted to farm but could not afford the costs of land and equipment that conventional agriculture required. Pia talked about attending Ecology Action's Three-Day Workshop in 1993 and liking what he heard as an answer to some of the above problems but being skeptical of the results. When he returned home, he established CIESA and after 3 years of researching the GROW BIOINTENSIVE method, proved to himself and others that Ecology Action's claims worked, and worked in Patagonia. frosts in the middle of the warmer growing season. Some of the most impressive slides showed green gardens growing lushly in the midst of a brown landscape, where Pia said only 16 inches of rain falls per year and winds reach 90 miles per hour. Pia described yields in his area as 4 times higher than the regional average for lettuce, 4 times higher for potatoes, almost 2 times for cabbage and 3 to 4 times for tomatoes. Moises Cuevas Vasques is the director of AALTERMEX, in Texcoco, Mexico, and its training and research center in organic GROW BIOINTENSIVE methods. Moises said that AALTERMEX, started in 1989, is a collaborative effort of the University of Chapingo, ECOPOL, Ecology Action and the University of Mexico City. The organization is made up of professors from the two universities, producers, and individuals. Vasques said they were first working with organic agriculture but that has since become such a confusing term and they found that GROW BIOINTENSIVE means sustainability. It does because it is based on the scientific principles of agro-ecology, including management of soil, fertility, vegetable nutrition, and water, and it is integrated with the existing environmental, social and economic conditions. Vasques then showed the results of their research as a series of graphs, comparing yields and prices received for domestic and foreign sales for various crops, with and without irrigation, using both conventional and GROW BIOINTENSIVE methods, in which GROW BIOINTENSIVE consistently outperformed conventional. Vasques described AALTERMEX's training courses, which last from one month to 2 years. The universities have also given credit and non-credit courses in GROW BIOINTENSIVE. In the last 10 years, 3,500 people have been taught. The University of Chapingo has been researching the GROW BIOINTENSIVE method for the last 5 years and has concluded that it is a method which works for the small family farmer. Yields in the 1996-1997 growing season in AALTERMEX test areas demonstrated Swiss chard yields that were 1.34 times the Mexican average, beets 2.6 times, broccoli 1.46 times, summer squash 3.58 times, onions 6.29 times, radishes 2.53 times and carrots 2.69 times. Vasques showed a fax he had just received from his Department of Agro-Ecology at the University stating it wants to start offering GROW BIOINTENSIVE as a core course. 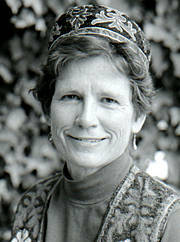 Carol Vesecky is the Director of GROW BIOINTENSIVE for Russia. In the mid-1980's, she became involved in citizen diplomacy activities that led to her current work promoting GROW BIOINTENSIVE through Russian language publications and workshops in the former Soviet Union. Vesecky talked about small-area dacha gardening, where city dwellers grow food on suburban plots. She said that 50% of urban people now have access to these plots and they are particularly necessary because approximately 30 percent of Russians live in poverty (70% live worse than they did in Soviet times), and there is a lack of affordable food in stores. 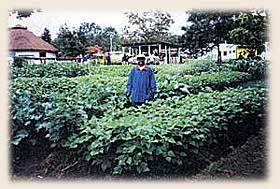 People grow virtually all of their vegetables, fruits and berries - 50% of their diet - in this way. Later in her presentations, she showed slides of some of these dachas and their bounty, including beautiful canned fruit and vegetables, which help feed Russians during the winter. She stressed that Russians truly are master gardeners, who start seeds on their windowsills in February and plant them out into coldframes in their dacha gardens during April and May. Vesecky also spoke about the GROW BIOINTENSIVE efforts going on throughout the former Soviet Union. She said there are currently 7 small GROW BIOINTENSIVE centers that are actively teaching and researching the method. These include ones in Chirchik, Uzbekistan; Bryansk, Russia; Novo-Sin'kovo, near Moscow; St. Petersburg; and Novosibirsk, Siberia. Her slides showed some of the participants at the workshops that have been given in these centers. She mentioned that a Summer 2000 Workshop Tour will take place again this year.